Onondaga Lake is located along the north side of the City of Syracuse in Onondaga County, New York. The lake itself covers an area of 4.6 square miles, has an average depth of 35 feet, and a maximum depth of 63 feet. Its drainage basin covers approximately 285 square miles. The lake flows into the Seneca River, then into the Oswego River, and ultimately into Lake Ontario. Nine Mile Creek and Onondaga Creek together account for 70% of the lake inflow. The Metro Wastewater Treatment Plant (Metro) located on the south side of the lake supplies another 20% of Onondaga Lake inflow. Figure 52 shows the lake, tributaries and some of the sites. Pollution in Onondaga Lake comes from three main sources dating from the 1880s forward: industrial discharges, municipal wastewater effluent, and stormwater runoff. 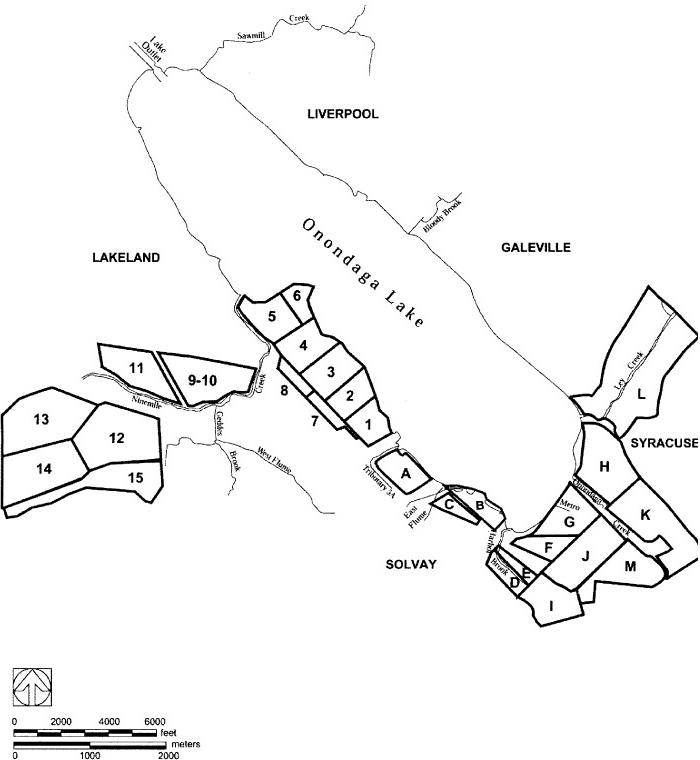 The Onondaga Lake Superfund site consists of the lake itself, seven major and minor tributaries, and twelve upland sources of contamination to the site (called subsites). The twelve subsites are listed below, along with the responsible party name for each, and are shown on Figure 53. Lower Ley Creek (several upland sources have contributed contamination; the most significant sources are the General Motors Inland Fisher Guide (IFG) Facility/Ley Creek Deferred Media, Ley Creek PCB Dredgings and Salina Landfill subsites). Two additional polluted sites (Wastebeds 9-15 that cover 663 acres and LCP Bridge Street – OU 2) are being remediated by Honeywell under state of New York enforcement agreements. The Onondaga Lake Superfund site is being addressed through federal, state, and potentially responsible party actions pursuant to enforcement agreements with New York State Department of Environmental Conservation (NYSDEC). NYSDEC is the lead agency for the lake bottom cleanup and all but one of the subsites. USEPA is the lead agency for the remaining subsite, Lower Ley Creek. Figure 52. View of Onondaga Lake, showing important tributaries, contaminated waste sites, wetlands and landmarks (facing north) (TAMS Consultants Inc. and NYSDEC 2002). Figure 53. Onondaga Lake areas of concern (NYSDEC 2017). Onondaga Lake suffers from three principal impacts: industrial/chemical discharges that began in the late 1880s, municipal sewage wastes, and stormwater runoff. From 1946 to 1970, approximately 165,000 pounds of elemental mercury were reportedly discharged to the lake. Sediments were contaminated with PCBs; pesticides; creosotes; heavy metals including lead, cobalt, and mercury; polycyclic aromatic hydrocarbons (PAHs); and VOCs such as chlorobenzene. Groundwater at many of the upland source areas was also contaminated with mercury, VOCs, PAHs, metals, and inorganics from the Solvay waste. Several species of fish native to the lake have elevated concentrations of mercury. Ecological and human health risk assessments conducted for the Lake Bottom subsite indicated that contaminants associated with the lake sediments resulted in risks which exceeded threshold levels to the ecological community and potentially to people who consume fish caught from the lake. Ammonia and phosphorus in sewage from Onondaga County-owned Metro contributed to impacts on fish migration and reproduction, led to algal blooms and poor water clarity, and decreased oxygen levels. In addition to the ammonia and phosphorus, stormwater runoff entering Syracuse’s combined sewer system overwhelmed the system during heavy flows and sent untreated sewage and stormwater to Onondaga Lake’s tributaries. These combined sewer overflows (CSOs) are a major source of bacteria, trash, organic material, solids and grit. Stormwater runoff in the Onondaga Lake watershed also carries pollutants to the lake and its tributaries. Pollutants include sediment from the Tully Valley mudboils, salt from highway ice removal, fertilizers and pesticides from lawns, gardens and farms, animal waste, and debris and floating trash from nearby streets (NYSDEC 2010). Major products manufactured during this period included soda ash (sodium carbonate) and related products; benzene, toluene, xylenes, naphthalene at the Syracuse Works’ Main Plant; chlorinated benzenes, chlor-alkali products, and hydrochloric acid at the Willis Avenue Plant; and chlor-alkali products and hydrogen peroxide at the Bridge Street Plant. The manufacturing processes resulted in releases of primarily mercury, BTEX, chlorinated benzenes, PAHs (especially naphthalene), PCBs, polychlorinated dibenzo-p-dioxin/polychlorinated dibenzofurans (PCDD/PCDFs), and calcite-related compounds (USEPA 2015c). Wastes were discharged to Onondaga Lake via the East Flume and West Flume/Geddes Brook/Ninemile Creek, the Solvay wastebeds and Semet Residue Ponds. The wastebeds were the primary means of disposal of inorganic waste from the production of soda ash. Initial Solvay waste disposal practices consisted of filling low-lying land adjacent to Onondaga Lake. Later, disposal areas were built using containment dikes constructed with native soils, Solvay waste, and cinders, or bulkheads made with timber along the lake shore. The Solvay wastebeds and the East Flume also reportedly received chlorinated benzene still bottoms and portions of waste streams from the Willis Avenue and Bridge Street chlor-alkali plants (Figure 54). Municipal sewage waste and CSOs discharges historically went to Onondaga Lake. Metro (see Figure 53 for location) has (1) upgraded to secondary and tertiary treatment (phosphorus reduction of 86%), (2) by 2010 reduced CSOs by an 85% volume, and (3) added green infrastructure to capture and reuse stormwater runoff. Ammonia and phosphorus concentrations in the lake have since declined significantly. Since 2007, the lake has been in full compliance with ambient water quality standards for ammonia and was officially delisted for that parameter in the state’s 2008 list of impaired water bodies. The lake is still impaired for mercury and fish advisories remain for PCBs, mercury, and dioxin. Figure 54. Historical locations of Solvay wastebeds (NYSDEC 2005). Stormwater runoff (also known as nonpoint source pollution) has also contributed to poor lake water quality. Land use activities in the watershed include agriculture (soil erosion, manure, fertilizers, pesticides), urbanization (litter/street debris, petroleum products/metals from roads, salt from highway ice removal, lawn fertilizer, pesticides) and construction (runoff/erosion during construction). Stormwater trash removal is now provided by vacuum truck for the stormwater catch basins and by skimmer vessels from the Inner Harbor. The Onondaga County Soil and Water Conservation District oversees the Environmental Management Program within the Onondaga Creek and Ninemile Creek watersheds to reduce farming related impacts. Other local efforts have provided stream bank stabilization, switching to phosphorus-free fertilizers and measures to control stream bank erosion and runoff. Natural mudboils produced by artesian groundwater within the Tully Valley impact the lake water quality, clarity, and aquatic habitat for insects, fish spawning, and plant growth along Onondaga Creek, the Inner Harbor, and Onondaga Lake. Mudboils are volcano-like cones of sediment one to several feet high and up to a diameter of 30 feet. The very fine clay and silt sediment load from the mudboils flows into Onondaga Creek, which flows north to Onondaga Lake and contributes half of the lake sediment load. The source of the mudboils is an 80 foot-depth semiconfined aquifer whose pressure is controlled by precipitation seasonal recharge. Seasonal variations increase/decrease artesian pressure and the mud flow discharge rate increases/decreases accordingly. The artesian head in Tully Valley aquifer was about 20 to 30 feet above land surface in 2014. An RI was completed in 2002. Mercury contamination is found throughout the lake, with the most elevated concentrations detected in sediments in the Ninemile Creek delta and in the sediments and wastes present in the southwestern portion of the lake. Other contaminants present within Onondaga Lake sediments are primarily found in the southwestern portion of Onondaga Lake. Glaciers carved the hills and valleys to the Upper Silurian through Middle Devonian bedrock, and upon retreat deposited a mixture of unconsolidated glacial sediments in Onondaga Valley, leaving Onondaga Lake and scattered moraine deposits. Industrial operations and waste discharges have impacted the sedimentary deposits, groundwater, stream and lake sediments, and surface water of feeder streams and Onondaga Lake. The geology is highly variable, and consists of noncontinuous sedimentary layers of fill material, a marl/peat layer, silt and clay, fine sand and silt, sand and gravel, till, and bedrock. The fill ranges from 5 to 40 feet thick and consists of broken brick, cinders, gravel, crushed limestone, sand, and ash. In some locations, the fill is interlayered with Solvay waste. At some places, the fill material lies directly on the till or bedrock. Groundwater has been defined as shallow, intermediate, and deep. Where present, the low permeability silt and clay layer acts as a confining layer for the deep hydrogeologic unit that exhibits artesian water pressure. In 1988, Atlantic States Legal Foundation filed suit against Onondaga County for Clean Water Act violations. A Consent Judgment dated February 1, 1989, required Onondaga County to perform studies to evaluate the need for upgrading Metro and for providing treatment of CSOs. In 1989, the state of New York filed a lawsuit in federal court against Allied-Signal Inc. (a predecessor company to Honeywell) for pollution violations and resource damage. In 1992, (1) the U.S. Army Corps of Engineers completed the Onondaga Lake Water Quality Technical Report with lake remediation alternatives, (2) the Onondaga Lake Management Conference funded a USGS study of the Tully Valley mudboils, and (3) a federal court approved a consent order for study of industrial pollution and development of a cleanup plan. In 1993, the Onondaga Lake Management Conference (OLMC) drafted “A Plan for Action” to become the basis of the Onondaga Lake Management Plan (OLMP). In 1999, the Onondaga Lake Partnership, led by the U.S. Army Corps of Engineers, was tasked with implementing lake improvement projects consistent with the OLMP and the 1997 Amended Consent Judgement. In 2005, NYSDEC issued a ROD for the Onondaga Lake Bottom NPL Subsite. Honeywell entered into a Consent Decree with NYSDEC in 2007. Court-ordered studies, studies by the USGS and U.S. Army Corps of Engineers, and potentially responsible party RI/FS documents have provided the data and resources supporting remedy evaluation and selection. The remedies have been selected by the state of New York, supported by USEPA Region 2, and documented using RODs and Consent Agreements. Pilot and treatability testing have been used to validate selected technologies and optimize full-scale remedy design. Five-Year Reviews are conducted to monitor continued protectiveness over the long-term. As of 2010, RODs have been signed for cleanup plans at ten Superfund subsites. The Onondaga Lake Superfund site is being addressed through federal, state, and potentially responsible party actions pursuant to enforcement agreements with New York State. New York State is the lead agency for the lake bottom cleanup and all but one of the subsites. USEPA is the lead agency for the remaining subsite, Lower Ley Creek. USEPA provided approximately $16.5 million to the state, through a cooperative agreement, for the performance of RI/FS activities, coordination and management of the independent subsite studies, oversight of PRP-conducted activities, implementation of a site-wide citizen participation program, creation and maintenance of a site-wide data base, and establishment of a comprehensive enforcement program. Other lake partners include the City of Syracuse, County of Onondaga, and the U.S. Army Corps of Engineers. The Onondaga Lake Superfund cleanup is being addressed in two stages: 1) interim remedial measures (IRMs) and 2) long-term remedial actions focusing on cleanup of the subsites. IRMs undertaken at the site include: removing chlorobenzene DNAPL from existing wells; retrofitting existing on-site sewers; on-site demolition, removal, decontamination and recycling of former mercury cell processing buildings and building materials; cleaning storm drainage systems; investigation of berms surrounding the Semet Tar Ponds; design and construction of a 7800-foot lakeshore barrier wall and groundwater collection/treatment system (Willis Avenue); and removal of contaminated sediments and floodplain soils from Geddes Brook and the East Flume. More details are below for each subsite. Onondaga Lake Bottom Subsite. 2.2 million cubic yards of contaminated wastes/lake sediment were dredged between 2012 and 2014 with disposal at a Sediment Consolidation Area containment facility. Isolation and thin-layer capping of approximately 475 acres of lake bottom was completed in 2016. Following a three-year in-lake pilot study conducted between 2011 and 2013, addition of calcium nitrate on the lakebed in the deep-water portion of the lake began in 2014 to inhibit methylmercury (MeHg) production. Since 2009, MeHg in the lake has been reduced by and estimated 98%. According to USEPA’s First Five-Year Review Report released September 2015, implementation of the remedy is progressing as expected. Concentrations of dissolved mercury are significantly lower in surface water samples collected between 2008 and 2014 relative to samples collected during the RI. This result is likely attributable to reductions in mercury loading to the lake from external sources such as tributaries and groundwater. Further reductions in dissolved mercury are expected from the implementation of the selected remedy. As a result of Metro upgrades and adding diluted calcium nitrate near the sediment/water interface in the deep-water portions of the lake since 2011, MeHg concentrations in lake water and in zooplankton have declined dramatically. Lower MeHg exposures from the water column and through the food chain are expected to contribute to lower mercury concentrations in fish. The combination of lower than projected concentrations of mercury in surface sediment and settling sediments, and higher average annual sedimentation rates than the rate assumed in the Final Design indicate that natural recovery in the lake is progressing faster than predicted. Due to the scheduling of various aspects of the remedial program and the nature of biological systems, it is premature in this first five-year review to determine whether the remediation has achieved the goals for mercury in fish tissue identified in the ROD. Future five-year reviews will have the opportunity to review data over sufficiently long time frames to determine the extent of compliance with the goals in the ROD. Geddes Brook/Ninemile Creek Subsite. An IRM removed 117,000 cubic yards of contaminated sediment and floodplain soil from Geddes Brook, a tributary to Ninemile Creek, which was impacted by mercury transported from the LCP Bridge Street subsite, between May 2011 and February 2013. The 16-acre wetland complex has been vegetated with nearly 90,000 native trees, plants and shrubs and is now supporting more than 80 species of fish, birds and mammals. Willis Avenue Subsite. Several IRMs have been completed for the chlorobenzene/chlorinated benzenes, and benzol production tar recovery of DNAPL that migrated to the lakeshore, a barrier wall, and a groundwater collection/treatment system (Willis/Semet GWTP processes 600 gpm) for caustic groundwater of pH>11 and contaminants related to the mercury cell, chlorinated benzene products, and Solvay processes. The effluent of the GWTP is discharged to Metro for further treatment. The 2014 RI/FS documented remaining soil contaminated with mercury, TCDD/furans, Aroclors 1254 and 1260s, and phenolic compounds. LCP Bridge Street – OU 1 Subsite. CERCLA IRM actions included removal of tanks, containers, and transformers; building demolition; sediment excavation and restoration of the West Flume and wetlands; soil washing, which reclaimed approximately 8 tons of elemental mercury; soil excavation of the Brine Mud Area and North Ditch; excavation of pipes and sewers and plugging the downgradient ends of these sewers, which provided preferential pathways for contamination to enter into the West Flume and East Ditch; and installation of a 50 foot deep slurry wall, groundwater collection and cap system for the contaminated soil (USEPA 2010c). The Diaphragm and Mercury Cell building demolition IRM consisted, in part, of removing and recycling elemental mercury from cells inside the Mercury Cell building, followed by its decontamination and demolition. Wastebed B/Harbor Brook Subsite. An underground steel barrier wall was constructed as part of an IRM. The barrier wall intercepts contaminated groundwater and chlorinated benzene DNAPL for treatment/separation. An RI/FS investigation is ongoing. Semet Tar Beds Subsite. Cleanup activities to date have included placement of an isolation layer beneath the Tributary 5A stream bed and construction of a groundwater collection system and on-site groundwater treatment plant. All major groundwater-related cleanup activities were completed in 2013. Additional IRMs have been completed to (1) clean and rehabilitate the I-690 storm drainage system, including adding an underdrain isolation system, located downgradient of the Semet Residue Ponds and Willis Avenues sites, (2) identify and investigate seeps in and around the berms which enclose the Semet Residue Ponds, (3) prevent human exposure to the seeps, and (4) provide engineering details as to the structural integrity of the berms. A study to evaluate potential remedial cleanup options for the Semet Residue Ponds material is ongoing as of 2015. Town of Salina Landfill Subsite. A waste consolidation of the five-acre landfill to the top of the main 50-acre landfill located north of the Creek and landfill cap was completed in 2013. A system to pretreat the contaminated groundwater/leachate collected from the closed landfill is expected to be completed in late 2014. The pretreated groundwater/leachate will be conveyed to Metro. Lower Ley Creek Subsite. Per the OU 25 ROD issued September 2014, PCB-contaminated soil and creek/wetland sediment will be excavated and disposed as appropriate for the PCB concentration, providing clean backfill, and vegetation per the habitat restoration plan, an IC restricting intrusive activities and commercial/industrial use will be executed, and a Soil Management Plan will be developed. PCBs are the main COCs but PAHs, mercury, chromium and arsenic are also present. Benzo(a)pyrene and dioxin are considered contaminants of potential concern (COPCs). Ley Creek PCB Dredgings Subsite. In 2001, historical spoil TSCA PCB dredgings left on the banks of Ley Creek were removed and properly disposed and a clean soil cover was installed over the remaining dredge spoils. Requires cover maintenance and five-year reviews. General Motors – Inland Fisher Guide Subsite. Completed IRMs include (1) capping an industrial landfill containing chromium and PCB waste; (2) removal of 26,000 tons of PCB highly contaminated soil from a liquid process waste discharge swale to Ley Creek; (3) construction of a retention pond to collect all water that accumulates on the IFG property in the former storm sewers and abandoned process sewers; and (4) water treatment system prior to discharge to Ley Creek. The RI/FS is in progress for the facility and groundwater. National Grid – Hiawatha Boulevard Subsite. Between September 2001 and May 2002 an IRM at the Syracuse Former Manufactured Gas Plant (MGP) subsite included excavation and removal of wood foundation pilings associated with former MGP structures and approximately 73,000 cubic yards of contaminated soils beneath the footprint of an Onondaga County sewage treatment facility upgrade. Wastebeds 1-8 Subsite. These Solvay wastebeds cover approximately 400 acres. DEC issued remedial action plans in 2014. The plans call for installation of cover systems and planting native vegetation. A 17,500-seat Lakeview Amphitheater was built on a portion of the site in 2015. Additionally, just over three miles of a groundwater collection system has been installed on the western shoreline (including collection systems installed at this site, as well as Semet Residue Ponds, Willis Avenue, and Wastebed B/Harbor Brook sites). The systems collect contaminated groundwater so that it does not enter the lake and send it to Honeywell’s Willis Avenue Groundwater Treatment Plant for treatment (NYSDEC 2017). LCP Bridge Street OU2 Subsite. A former hydrogen peroxide plant was located on this 1.6-acre area (USEPA 2010c). The selected remedy includes injection of chemical oxidants into the ground to treat the contaminated soil and groundwater; construction of a cover to prevent contact with contaminated soils and migration via stormwater runoff; development of a site management plan; long-term monitoring: and an IC to (1) limit the use and development of the property to commercial/industrial use; (2) insure compliance with the site management plan; and (3) restrict the use of groundwater for drinking. The remedial design was projected to be completed in 2012. Wastebeds 9-15 Subsite. These former settling basins located on 663 acres were used for disposing residue from the Solvay Process. The waste is primarily nonhazardous calcium carbonate/chlorides from the manufacturing of soda ash but included other area wastes. These waste sources are from the Bridge Street Chlor-alkali plant (spilled materials, mercury, asbestos, lead, and wash water), chlorinated benzene manufacturing at the Willis Avenue plant (asbestos, wash water, spilled material, lead, mercury, and heavy organic residue), Allied Chemical plants (fly and bottom ash), County’s wastewater treatment plant sewage sludge, Anheuser-Busch brewery sludge, and brine purification muds. Wastebed 15 also received demolition debris and soil from decommissioning the Allied Chemical main plant. A portion of the old Erie Canal, which lies beneath Wastebed 15, was used as a landfill by the Town of Camillus. Under authorization from NYSDEC, the Town of Camillus operates a construction and demolition waste landfill in portions of Wastebed 15. Sediments removed from Onondaga Lake as part of the Lake Bottom remedy have been dewatered and are permanently stored in an engineered Sediment Consolidation Area (SCA) located on Wastebed 13 (USEPA 2010c). While hazardous substances are present at the Wastebeds, the available data indicates that the levels of contaminants from the Wastebeds that are adjacent to Ninemile Creek are minimal and that they do not impact Onondaga Lake. NYSDEC is currently negotiating a consent order with Honeywell for an engineered cover and long-term maintenance and monitoring of Wastebeds 9 to 15 to mitigate environmental concerns. Onondaga County Metropolitan Syracuse Wastewater Treatment Plant (Metro). Metro has upgraded to secondary and tertiary treatment achieving a phosphorus reduction of 86%, reduced CSOs by an 85% volume, and added green infrastructure to capture and reuse stormwater runoff. Natural Mudboil. In 1995, The Onondaga Lake Management Conference authorized the construction of two settling basins and several depressurization wells to reduce the mudboils flow of sediment to Onondaga Creek (an average of 30 tons per day has been reduced to one ton per day). In 2010 a new mudboil area began downstream of the remediation projects, but with higher salinity. Control of the mudboil discharges will require continuous, long-term attenuation of aquifer pressures to reduce groundwater upwelling. Mudboil reduction will also reduce land subsidence and abate sediment discharges into Onondaga Lake. Via a separate 2010 Consent Order associated with an Onondaga Lake subsite, Honeywell agreed to an Environmental Benefit Project to provide funding for five years to help address the mudboil problem on Onondaga Creek. Kappel (2014) recommends actions that achieve a careful balance among (1) reducing the head in the aquifer to slow mudboil activity; (2) reducing concurrent turbidity discharges to Onondaga Creek; and (3) minimizing land-surface subsidence associated with mudboil activity to maintain the chemical quality of Onondaga Creek. Total cost for remediation efforts by Honeywell has been estimated by NYSDEC to be $451 million. Upland waste closed in place will require perpetual groundwater treatment and ICs to prevent groundwater use and restrict land use to commercial/industrial. The contaminated lake bottom sediments will require perpetual calcium nitrate injections to prevent mercury methylation. The Onondaga Lake Superfund site is being addressed through federal, state, and responsible party actions pursuant to enforcement agreements with NYSDEC. Each of the state and Federal actions comply with the regulatory requirements for formal public comment on draft decisions (Proposed Plans and RODs). 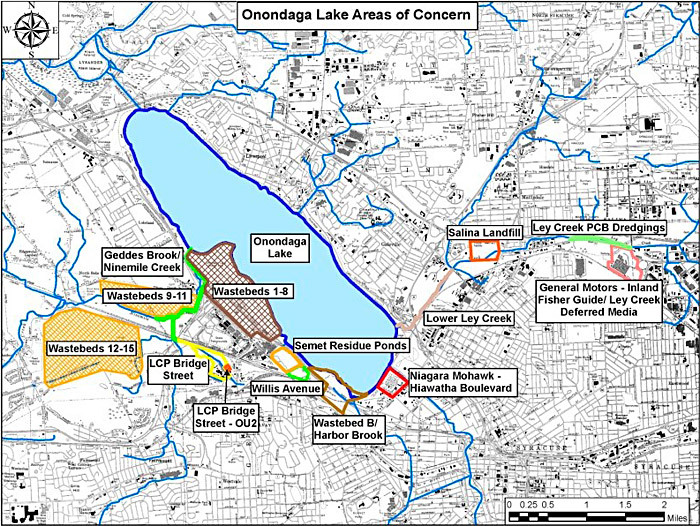 NYSDEC and Honeywell are required to keep the public informed and engaged in the cleanup decisions and lake bottom construction activities as outlined in the 2008 Citizen Participation Plan (CPP) for the Lake Onondaga Lake Bottom Subsite Remedial Design Program. Honeywell provides financial and administrative assistance for the Community Participation Working Group (CPWG), an independent panel of community stakeholders that inform, discuss, make recommendations, and offer opportunities for community involvement and input throughout all phases of the cleanup. Their work includes an emphasis on reviewing project progress and community outreach activities. 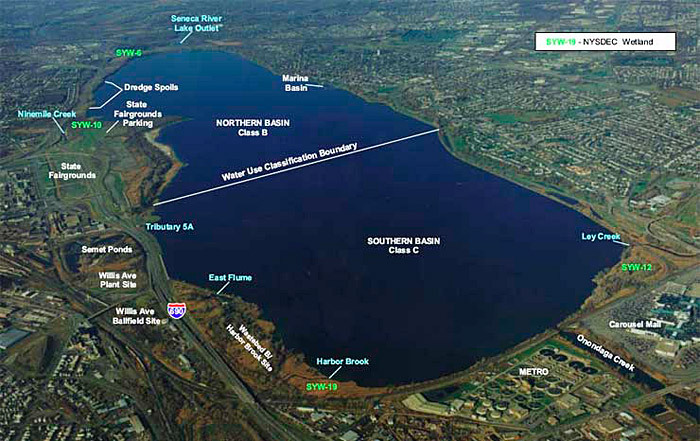 The CPWG is a self-governing voluntary group dedicated to providing a forum for enhancing public dialogue, fostering public understanding, and encouraging input and discussion for the Onondaga Lake bottom remedial design. The CPWG meetings are open to the public and consist of public officials, community leaders, citizens, and conservation and environmental group leaders. Technical experts from NYSDEC and Honeywell provide support to the group. The CPWG maintains a website to keep the public informed of current and historical activities, including legal decisions and news articles. Onondaga County is one of the responsible parties from their historical discharge of municipal wastewater to the lake. The Onondaga County Water Environment Protection maintains a website regarding lake restoration progress, including ambient monitoring results. The Onondaga Nation is a major stakeholder because the lake area is their homeland. The Nation and its people have a unique spiritual, cultural, and historic relationship with the land, which is embodied in Gayanashagowa, the Great Law of Peace. The Onondaga Nation is a federally recognized tribe whose 9.3 square mile reservation is located a few miles away. The Onondaga Nation sued the State of New York, the City of Syracuse, Onondaga County, and five corporations for illegal land takings and damage inflicted on Central New York’s environment. In 2014, a federal judge dismissed the lawsuit. The Onondaga Nation is involved through government-to-government consultations. They chose to be considered a separate nation rather than to be considered as a community partner in the OLP, and thus chose to be involved solely through discussions between their attorney general and New York State or USEPA officials.